It is hard to believe how quickly this year has gone by, and it seems as every year goes by even quicker. At my Outdoorsmen Productions office, and in my life, there have been quite a few changes. As most of you know, I love hunting, with my spring turkey hunts the earliest hunts, one of my favorites, where in years past I hunted in several states for gobblers. This year, I only hunted in Nebraska as it was a busy time at the office; I did manage to call in a couple of nice birds. One with good friend and co- host of Outdoorsmen Adventures television Larry Myhre, where we had a gobbler respond, then just follow his hen along a fence line with no shot available, I grabbed my fan, crawled 40 yards as the gobbler was just going into a group of cedars. I called, flashed the fan and before I could drop the fan, had the gobbler charging towards me, I had to shoot it at less than seven yards in “Self Defense” as it came under the fence. Fanning a gobbler using a dried turkey tail is something that works well during the early and mid season and will bring them in sometimes when you are not ready for them. DO NOT use it if there are other hunters in the area, as when an inexperienced turkey hunter sees a fan, he may get excited and take a shot at it. I would hate to see any of our readers get hurt because of some advice I gave them, so be alert when you use them. I also had the pleasure this year to call in my daughter Heather’s son Dylan’s first gobbler, an exciting hunt, another bird that caught us off guard. We were relocating from the north side of the shelterbelt, heading to some heavier timber, when a hen came strolling across an open area. Caught in the middle of the trail between the two shelterbelts, all we could do was kneel down and wait for her to pass. As the hen made her way into the trees, I could see the fan of a gobbler come up; its back was towards us, I motioned to Dylan to find some cover, while I hunkered down behind my fan. As the gobbler came into the opening it turned towards me and started coming my way, to peak its interest, I called softly each time it seemed to lose interest. As I waited for the shot, the bird approached, eye balled my fan, swung around as I waited for the shot. I was not sure what was going on, and as this big mature “Mad” gobbler hissed, gobbled, drug its wings on the ground and fanned his way towards me, I thought if something did not happen quickly, I might be in for the fight of my life. I started to lower the flag and bring up my shotgun when, Boom, the gobbler tipped over and rolled down the lane. As I stood up and Dylan came over to gather the bird, I asked him if he had not heard me telling him to shoot. He had, but as we moved from our last location, he had emptied the chamber of his gun and his first shot was a click on that empty chamber. His bird was a big mature Tom and by the smile on his face I would bet he gets his turkey permit next spring and comes back up to hunt with me. We had a great fishing season, but did not as much fishing as we hoped to do because of all the rain and wind we ran into this year. Larry Myhre and I had a great trip in Pierre, S.D. on the Missouri River with Paul Steffen, where I used jigged a Northland’s Puppet Minnow lure catching a number of the 40 walleyes we took in three hours on the Missouri River downstream from Pierre, the largest 15 to 18 inches. The following day on Lake Oahe, in a couple of hours we trolled for northerns, caught twelve pike in a couple of hours along with a salmon and smallmouth bass. The fish throughout the Missouri river of South Dakota are bulking up as the prey species are coming back since the big flood. I would give fishing in those reservoirs in 2019 as they will give up some good walleyes and huge smallmouth bass. As usual, our trip to the Glacial Lakes and Prairies area of northeastern South Dakota did not disappoint us. The numerous lakes in the Watertown, Webster area, hold such huge numbers and varieties of fish; you do not have to go far if you want to pursue a different species. Alternatively, if the water you are on, the fish are not cooperating, you do not have to go far to find active fish on one of the hundred or so lakes in that part of the state. In 2018, several things have changed on our Outdoorsmen Adventures television show, as Josh Anderson and Mitchell Sudbeck; Hartington purchased the rights to the show and took over in July, with Outdoorsmen Adventures having a new look. I will remain as a consultant for the show, helping wherever I can for a few years. Larry Myhre and I will still co-host the fishing shows, traveling to different areas and states, fishing with some of the best anglers in the upper Midwest and highlighting many of the finest bodies of water you have ever fished. 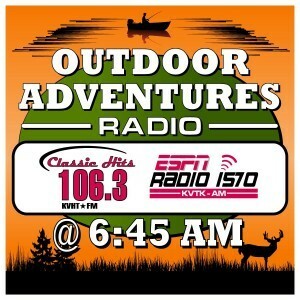 As far as our Outdoor Adventures radio show, it still airs six days a week in southeastern South Dakota, northeastern Nebraska on 106.3 FM, 1570 am and added another station 93.7 fm and 1260 am in the Winner S.D. area. In northwestern Iowa, Outdoor Adventures is heard six days a week on 92.1 fm. The Dove hunting in the upper Midwest was not the best as rain; cooler temperatures bunched the birds up birds up and started them moving south. We had one good hunt, where my hunting partners, Dani and Anthony Thoene and myself took a few birds, but from opening day, the birds were migrating and those coming in from the north did not spend much time around here. We would have better Dove hunting opportunities if the season were opened earlier, the first or fifteenth of August, before the onset of cold weather. This year’s upland game bird hunting was not the same for me as my loyal hunting partner, my black Lab MO Jo passed, which was a great loss to our family as all our pets are more family members than just pets. It just did not seem that going out into the field without Mo was worth the effort. That and the fact that the few CRP enrolled acres are just starting to become good habitat; there was not a lot of habitat to hunt. I did get out once with a couple of friends and a black Lab named Pele later in the season where we saw quite a few birds in the 160-acre field, one too large for our small group, we managed to get some shots at birds, but only came home with one. I also had a deer tag, but since my wife has tired of wild game, suggesting that I do not bring it home, and at times flat refuses to allow me to bring it into our house. James Christensen, Hartington, Neb. 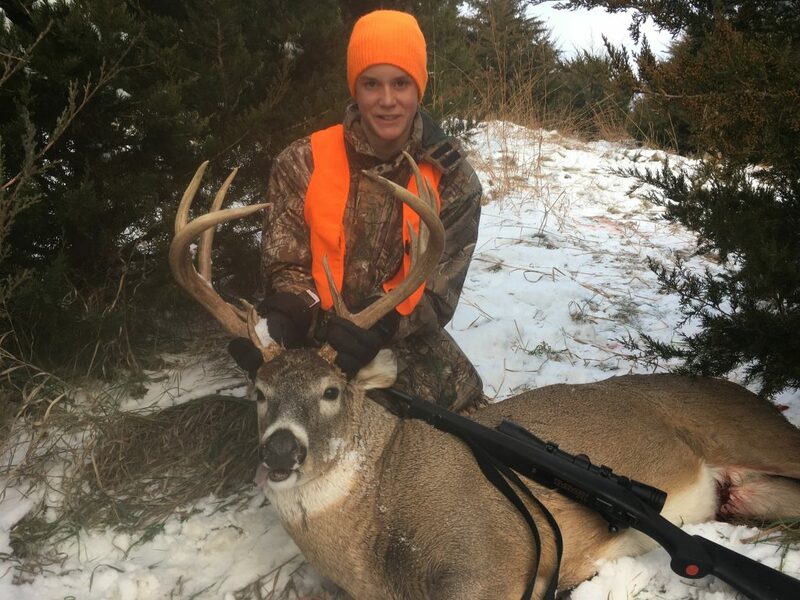 with the trophy buck he took while hunting the Nebraska 2018 rifle deer season. I have one of the editors who work for me, whose family likes deer meat and willing to take a deer if I tag one, so I hunt for them. Since the deer hunting ground, I had hunted on for years, where I had my ground blind and deer stands located was entered into the Nebraska Game & Parks Management access program, last year and could be crowded, I looked for another place to hunt. Luckily, for me, one of our Team Members families has some good deer hunting land and they allowed me to hunt out of one of their deer houses opening day. As the land I was hunting was established as a management area, an area where smaller bucks, those with potential were passed up, allowing them to grow larger. Those with little potential, those whose rack did not change from one year to the next, and those with inferior genes culled, removed from the herd. I would hunt from a one-man portable blind overlooking several ravines, tree lines as well as several harvested fields the deer traveled. I was more than willing to see if I could help them with it and when the cull buck came out of the ravine, and walked into a group of cedars on a side hill 180 yards from my blind, I was ready and waited for the deer to give me a clean shot. When hunting deer, I use a 25:06 with Hornady’s American Whitetail 25-06 Rem 117 gr. Interlock BTSP shell, which is a deadly combination for deer hunting. Over the years, no matter where I hunted and or what type of terrain I hunted in, it was a flat shooting gun deadly on deer. At 9:20 on opening day as the big-bodied buck stepped from the cedars into the opening between the trees, I centered my cross hairs on its vitals, gently pulled the trigger, and heard the bullet hit its mark with the deer tumbling down the slope into the bottom. A little over an hour later as I made my way to my office, I stopped by Stop N Go in Hartington, checked in the deer and was back at my office working on my columns by 11:30 that morning. The ice fishing around here has not really taken off with some adventurous types have been on the Refuge Lakes, taking a few fish, but not too many anglers talking about ice fishing. Up north in the Glacial Lakes of Northeastern South Dakota, some of our guys have fished Big Stone, Waubay and several other lakes, and caught some nice fish. While on other lakes in that area, the Game, Fish and Parks has warned anglers to be careful as there was not a lot of ice to begin with and the warmer weather we currently have has not helped the situation. Some hunters in the Dakotas and Nebraska in 2018 thought that the turkey numbers were down; it might have been in a few areas, but the several places I hunted, and talking with hunters throughout the upper Midwest, there was good number of both young and older birds, so this spring we should see plenty of turkey activity. As I look forward to 2019, I’m optimistic, hoping for good weather and a lot outdoor activity and if our winters are not too tough, the springs not overly damp, there should be some pheasant reproduction on those older CRP acres. Now, that I am supposedly semi-retired, I hope to spend more time on the water and in the field and if our paths cross, we run into each other, give me a holler and we will talk about fishing and hunting in between landing fish and harvesting birds. We at Outdoorsmen Productions my family and myself want to wish everyone a successful new fishing and hunting season and a very Merry Christmas and a Happy, Healthy and Prosperous 2019. Gary Howey, Hartington, Neb. is a former tournament angler, fishing & hunting guide and inducted into the National Freshwater Fishing Hall of Fame in 2017. He is the Producer/Co-Host of the award winning Outdoorsmen Adventures television series. If you are looking for more outdoor information, check out www.outdoorsmenadventures.com, & like Gary Howey’s Outdoorsmen Adventures on Facebook or watch his shows on www.MyOutdoorTV.com.